To Be or Not To Be (an organ donor)? You don’t need to take your organs to heaven. I have it on really good insider information that you are not going to need them there. So please stop reading right now and do the donor thing. Thanks! Now there is another kind of organ donation that can be provided without having to wait until death. At the top of the page is a collage of 60 photographs of individuals. They are kidney donors and kidney recipients. As it turns out, a little fluke of our human evolution is that we really don’t need both of our kidneys. That’s the good news. The bad news is, even though we all have two, one is not a back up for the other. If one goes bad, they both go bad and the choice then is long days attached to a dialysis machine to clean out your blood (which is what kidneys do) or death. Or, that third amazing miraculous possibility: a transplant. Most transplants are in fact from deceased donors, the kidneys and other organs “harvested” while the heart is still beating, but the person has been declared dead. I know this is scary sounding stuff, but there are rigorous medical, legal and ethical regulations assuring that no is put at risk or compromised or taken advantage of. It is of course a very emotional time for family members, which is why I strongly encourage you to take care of your donor wishes long before anyone has to grant them when you die. There are many very moving stories about tragic deaths followed by inspiring lives saved by transplants. The NYT article though is about live donors. It is typical for live donors to be family members or friends of the recipient. Both operations take about 3 hours and recovery is a couple of weeks. But often there is no one in the family who is an exact match. If this is the case, then the would-be recipient becomes one of 90,000 people who wait on a donor list for a kidney from a deceased donor. Fewer than 17,000 people receive a kidney every year from the list and about 4,500 die waiting. If there is no match among family and friends, there is one other option to just waiting on the donor list. There is a way of making all those mismatches actually work and save lives. According to the NYT article what it takes is one anonymous donor to start a chain of matching from the jumble of mismatches. One person who has no connection to anyone who needs a kidney, just gives one up. In the chain depicted in The Times, it was one guy, Rick Ruzzamenti, in Riverside, California. He donated his kidney to anyone who would need it, a total stranger who was a match. Someone in that total stranger’s family donated their kidney to another total stranger who was a match. Someone in that recipient’s family donated their kidney to another total stranger…and on and on it went…..30 kidneys, 30 lives saved. Miraculous. I must say I read this article over and over and over again. I went online and read about the procedure and the risks and down loaded the consent forms. I had lots of accrued sick time although I don’t think I could have used it since kidney donations are elective procedures. I am not a brave person and I don’t think I could have done it, but I did fantasize a lot about it. Then two things happened. I left the hospital where I was working…and all that paperwork sat on my desk. And then something else happened at that same hospital. The sister of a dialysis patient was donating a kidney for him. He had been on the waiting list for two years and she was a match. She winked at him as they were wheeled apart for their separate but perfectly orchestrated procedures. 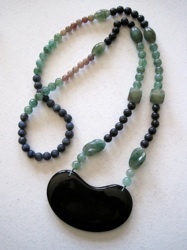 And then she died on the table….an unexplainable slip of a scalpel severed her aorta. She bled to death before she could be saved and before even one of her kidneys could be saved to save her brother. The statistics for live kidney donation indicate that the procedure is very safe. Only a chance of 3 in 10,000 people die as a result of the procedure. But there are the statistical 3 and Yolanda Medina was one of them. Tragically her brother is still waiting for a kidney….maybe there will be an anonymous donor since he is way down on the donor list and could have to wait for years, if he has that long to live. Please share this information about live donors. There may be someone who knows someone who knows someone who knows someone who like Rick Ruzzamenti will say, “Take my kidney, please!” It might be someone a little crazy, or very egotistical, or spiritual, or who knows what motivation, but it could be someone who can start a chain of miracles. Not all of us can do it but maybe we can be messengers. Maybe there will be that anonymous donor….maybe not. Last Monday was Memorial Day, the day that extends a weekend to three days, celebrates the beginning of summer and commemorates those who have died in wars with ceremonies, parades and poppies sold at grocery stores. In my small town USA village of Piermont, New York, there was the annual parade through our little town to the Veterans Monument. I had played tennis early in the morning and was returning just as our Piermont Police Department was starting to close the main street with saw horse barricades diverting cars through the pier parking lot. After a quick handshake through my car window with my favorite Piermont cop, I took the detour, arrived up the hill at my house and grabbed my bicycle (oh, yes, got out of my sweaty tennis clothes and slipped into biking shorts.) I cycled down to the Veteran’s Monument and got a good spot for the parade which consisted of the Fire Department volunteers in their uniforms, the very impressive Piermont (“on-the-Hudson”) fire trucks, our Mayor, and the Yonkers Pipe and Drums Band wearing kilts. And, there were several veterans of wars marching, elderly gentleman who I would guess had been in WWII. There were a few speeches and prayers, the band played “God Bless America,” it was over, and the crowd dispersed. There was also another Memorial Day event that was taking place out at the end of the pier. 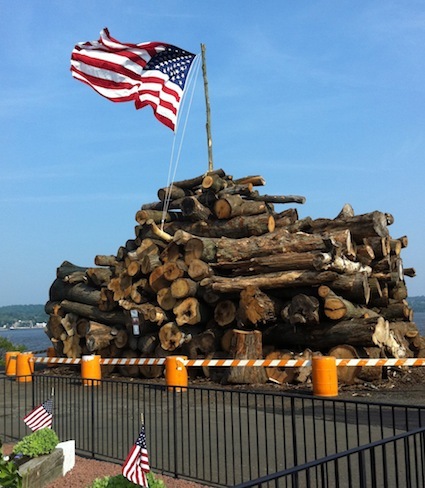 Every year on Memorial Day a huge bonfire constructed with enormous tree trunks is built right on the river. It is lit at midnight and burns through Memorial Day until midnight and then is bulldozed into the river. It’s a pretty impressive site for our little town. It’s called a Watchfire, a homecoming fire. It is a blazing light in the dark night to welcome back all of the souls lost far away and to bring them back home. While all this was going on, and people were stoking their barbeques, I was thinking about all of those wars, all of the lost and damaged lives. In fact I Googled “US in Wars” and opened up a chart that you can access on Wikipedia. There was much more information than I expected. In the meantime I couldn’t help thinking about other “wars.” The war on poverty…who and what are we exactly fighting? Was there a beginning? Will we win or will poverty win? The war on drugs. The war on crime. Many responses indicated that if more women were in power that more wars would be prevented because women are more inclined to negotiation, conflict resolution, and a focus on health and well-being for themselves and their families. Former Chilean President Michelle Bachelet, the first Under-Secretary-General and Executive Director of UN Women, discussed the role of women and war–and the importance of having more women in power to lessen conflicts around the world. An interesting connection, or perhaps it is the disconnection, of war and health is in the little Central American country of Costa Rica. In 1991, after having researched the substantial decrease in infant and maternal mortality and increased health and well being of children and families based on the Costa Rican home visiting program, I traveled to San Jose and had a meeting with Dr. Lenin Saenz, one of the architects of the government-funded health care program. The program included visits to every family in Costa Rica four times a year to assure that all children had their vaccinations, that pregnant women were receiving prenatal care, that the family had clean running water and everyone was in good health. The visits were done by community health workers who had been soldiers in the war against mosquitoes. Yes, the war against mosquitoes was mounted by a collaboration between the United Fruit Company and the Costa Rican government. So many farm workers were dying of malaria that the fruit export business was suffering. Literally armies of mosquito eradicators were employed in the joint effort. By the late 1960’s, the mosquito was defeated and Costa Rica was free of the tyranny of malaria. But now what to do with all of these people who had visited every part of the country spraying and removing breeding areas? Dr. Saenz and his colleagues in the Costa Rican government decided to fight on…this time against infant mortality, maternal mortality, water borne diseases, and just for good measure, illiteracy. They retained the army of workers and re-educated them to be home health visitors. Within 10 years between 1970 and 1980, the health status of Costa Rica dramatically improved as indicated by the drop infant mortality by 69 percent from 61.5/1,000 to 18.6/1,000. How did they finance this one might ask? All those health workers fighting disease. Well, they used money that other countries use to pay for their military. Costa Rica in 1948 had decided not to fight their own people or other countries; they disbanded their army. Since the mid 1980’s there have been financial challenges that have impacted the success of the Costa Rican war against disease, but there is still no military and the health status far exceeds that of most countries in the world. As for Memorial Day, I continue to think about the Watchfires bringing everyone home.